With fall and winter quickly approaching (although, unfortunately, it doesn't quite feel like fall in California), I'm starting make more and more cold-weather accessories. There's something about cold weather that makes me really excited about crocheting--snuggling up in your crochet nook, sipping on tea, listening to your favorite music--sounds like the perfect way to spend an afternoon. I came up with this super cute boot cuff pattern. They're perfect for keeping your legs warm while looking stylish too! The pattern allows them to be adjustable to you, and you can make them in any color you like. The gauge is not important for this project. You may sell the finished project, but please reference and link this post. Please do not copy and post this pattern and claim it as your own. You can purchase this item from my Etsy Store. Work 10 hdc across. 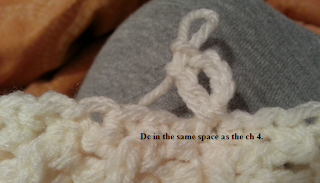 For the knit ribbed effect, make the hdc in the loop below the stitch you would normally do the hdc in. Ch 1 and turn at the end of each row. Fold the piece in half and sl st the end with the beginning to make a circle. Fold the piece inside out so the seam is on the inside. Turn on its side; you will now be working in rounds. Ch 1. Sc evenly around (however many rows you made for the ribbed portion). Sl st with beginning sc to join. Ch 4 (counts as dc and ch). Dc in same space as the join. *Skip 2 sc. (Dc, ch 1, dc) in next sc. * This is the V. Repeat from * around. Sl st to join in top of ch 4 to join. It's okay if you don't have exactly 2 sc to skip between the last V and the top of the chain 4. Ch 4. Dc in same space as join. *(Dc, ch 1, dc) in space between Vs* Repeat from * around. Sl st in top of ch 4 to join. Ch 1. Sc in each dc and ch 1 space around. Sl st in ch 1 to join. Fasten off. Weave in ends with the tapestry needle. Sew on brown button with the white thread near the top (ribbed section). I put mine where the seam was. I'd love to see pictures of your finished product! You can post them on my Facebook page or put them on Ravelry. You're welcome! Let me know if you have any questions about the pattern. Please post pictures of your finished product, I'd love to see them! I hope your friends enjoy them. Happy crocheting! I don5 know if you are still managing this, but I have a question on the hdc st on row two to get the ribbing. Are you wanting us to put a hdc in the front loop of the stitch or do a hdc in the back loop or go through the whole stitch? I was a bit confused even with the pics. I'm sorry I'm new with reading patterns lol thanks! 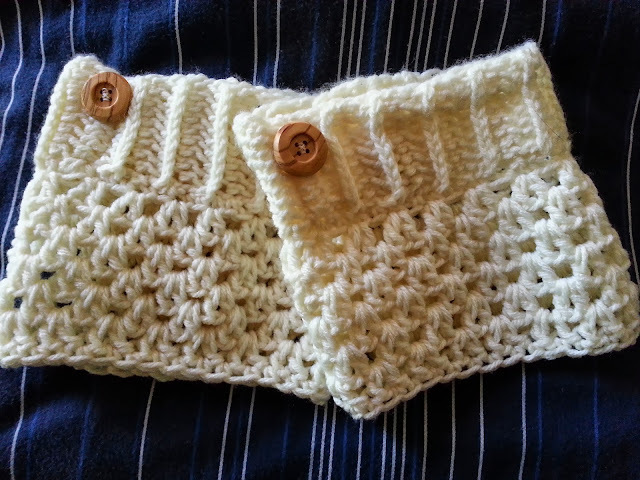 Hi dear, I've just finished these wonderful boot cuffs... 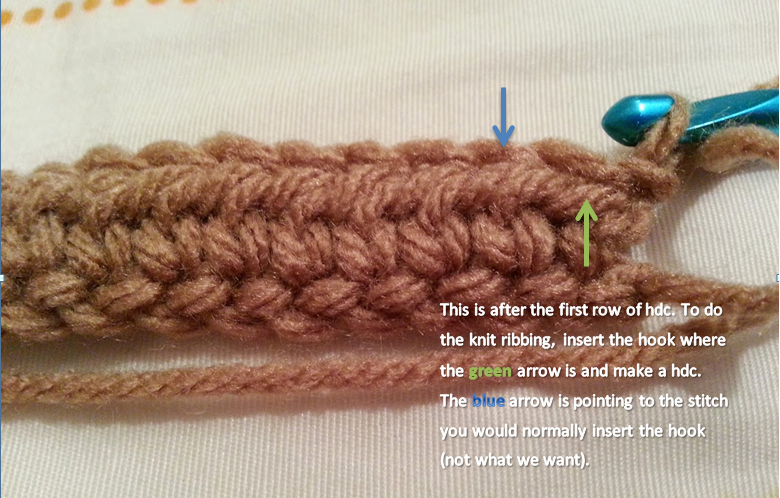 I want to thank you for sharing this pattern and I would like to send you the pic of mine... Can you tell me how to do? You can upload your picture on your Google+ account and then post the link in the comments. Hope this helps. Glad you enjoyed the pattern! Yes, I can see it. You did a great job on them. Thank you for sharing your picture! Just completed a pair! Thanks for the pattern! Hi, I'm somewhat confused by your pattern. When you say in row 2 to continue on to make about 35 rows, I don't know what your instructions are saying to do then for row 3. Do I continue to make 35 rows? Or do I follow what it says for row 3 next. Thanks for your comment. Repeat Row 2 until you have about 35 rows (or however many will be enough to fit around your calf). Then move onto Row 3. Hope that helps. I've updated the pattern to, hopefully, make the instructions clearer. Hi Justine, I was wondering if I could use an h hook instead of an i hook? Absolutely! You may have to make a few more rows for the top portion of the cuff, but just keep checking it around your calf until it fits. Thanks for your comment, can't wait to see your finished product! Ok! Thanks, I will post a pic when I make them! I love this pattern! The cable effect of the stitch is beautiful! I am making a pair for my youngest daughter...but suspect I will be making many pairs for her friends! Thank you so much for sharing the pattern! Thank you for the comment. And you're welcome! I hope you enjoy making them. I would love to see pictures of your finished product(s). Happy crocheting! Thank you! With everyone wearing boots these will be great gifts. Thanks for your generosity in sharing. You're welcome! Happy crocheting! I would love to see pictures of your finished products. If you can, will you please post them on my Facebook page or on Ravelry? Thank you so much! I'm lost. I'm new to crocheting though. First my top of the cuff did not come out like your rib effect. Then when start on the bottom of the cuff I'm confused there too. Is the top of the cuff done flat then it will be sewn together later? and only the bottom of the cuff is done in the round? Maybe pictures would help for each step for us beginners lol. 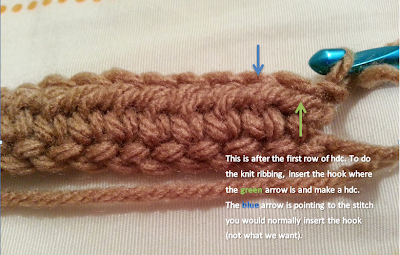 The top portion of the cuff is worked flat in rows (as if you were making a mini scarf). 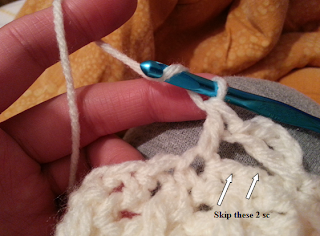 Then, bring the end of the "mini scarf" to the beginning of it and slip stitch together to make a circle. Please refer to the pictures I have about the ribbing under Row 2. 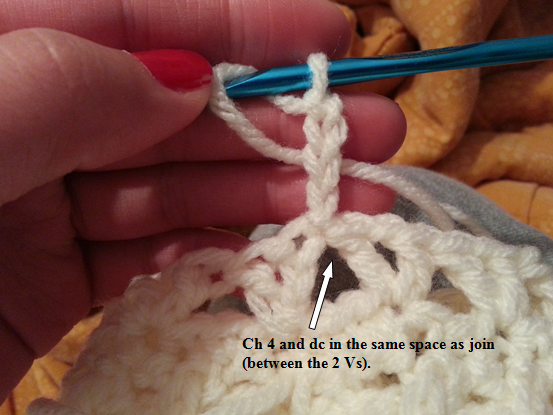 Make sure you're only going through the one loop that's below the normal half double crochet stitch. Now you will work in rounds for the bottom portion. It's worked all in one piece so you don't have to sew anything together. If you're still having trouble with the cuffs, shoot me a message on my Facebook page (www.facebook.com/crochetfromj), and I'll send you pictures of each step. Thank you so much for more pictures as a newbie to this it helps a ton! I am hoping to finish them soon! You're welcome! I'm glad I can help! Hi Justine! I love your boot cuff pattern. The directions were clear for me to follow and they turned out great My oldest daughter loved her ivory ones I made for her. She gets compliments every time she wears them. I just finished another pair in olive green. Thank you for sharing your pattern. You are very talented! You're welcome! I'm so glad you like my pattern, and I'm glad your daughter enjoys the boot cuffs. If you can, please post pictures of your finished product. I'd love to see them! You can post the link here or post the pictures on my Facebook page (www.facebook.com/crochetfromj). I'm so glad I found this pattern. I love the knit look stitch. I'll be using it often. Yes, you may absolutely use DK yarn! I would recommend using an H hook (5.00 mm) instead of I hook (5.50 mm). I am thrilled to have found your blog with these instructions, including detailed photos. I am new at crochet and can hardly wait to try my hand. Thank you so very much! Hey! Im so glad I found this pattern!! Ive been so excited to make them! I keep running into a problem though, once I start rounds 3-7 it starts to flare our rather than staying straight and I nor to sure why?? It could be you have too many single crochet from round 1. It's hard to see where to make the sc in that round, but it is important that you make the same amount as how many rows you made for the top portion. Hope this helps! 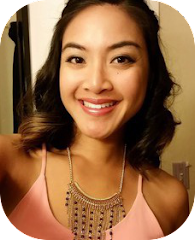 Hi, please correct me if I am wrong Justine.. but I noticed mine flared out from rounds 3-7 also because I was not dc on only the Vs but on the other holes as well. There are smaller holes (like a diamond) between every V hole (wider & pyramid shaped). Do not dc on the smaller holes, or it starts to flare. just finished a pair , but they both are to small to even come over my foot much less come up over the calf.what went wrong??? The number of rows for Row 2 of the Top Portion of the Cuff determines the width of your boot cuffs. The more rows of Row 2 you make, the larger it will be. You'll want to make enough of Row 2 to go around your calf. 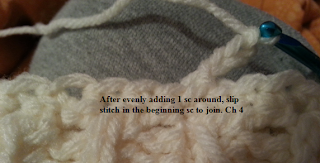 Then, when you slip stitch the ends together, it should be able to go up to your leg. I hope this helps, let me know if you have any other questions. Wonderful pattern- thank you for all your work and willingness to share! Thanks! I'm glad you enjoyed the pattern. Hope your boot cuffs turned out great! i love this pattern so much! i am going to be making several pairs as christmas gifts. i love that you have an etsy store as well. i have been considering opening a store on there for a while but unsure how the items would sell. do you make a good amount of sales on there? I'm so glad you like the pattern! Your friends/family are going to be really happy with your hand-made gifts! :) My Etsy store is just something I do for fun, so I don't advertise that much or promote it (except here on this blog). So I've only had about 13 sales. I'm not very concerned with it, but I'm sure if you advertised it you would be very successful with it! Give it a shot. And hey, if you do decide to, I can send you an email with an invite link and I'll get free listings ;) Happy crocheting, and Happy Thanksgiving! Thank you so much! I never knew how to make it look knitted and you explained it so well! I'm gonna make some for my mom's birthday. ^.^ Happy holidays! After trying the first cuff, I had to rip it out and started again as I was not getting the ribbed effect. I reread your instructions and finally got it. I am at a standstill on both cuffs as I am waiting to hear from someone regarding measurements. Can't wait to keep going. Wonderful of you to share this pattern! Merry Christmas!! Hope they love the boot cuffs you made! Merry Christmas to you too, and happy new year! What weight is the yarn? The weight I used for this pattern was worsted weight (DK). 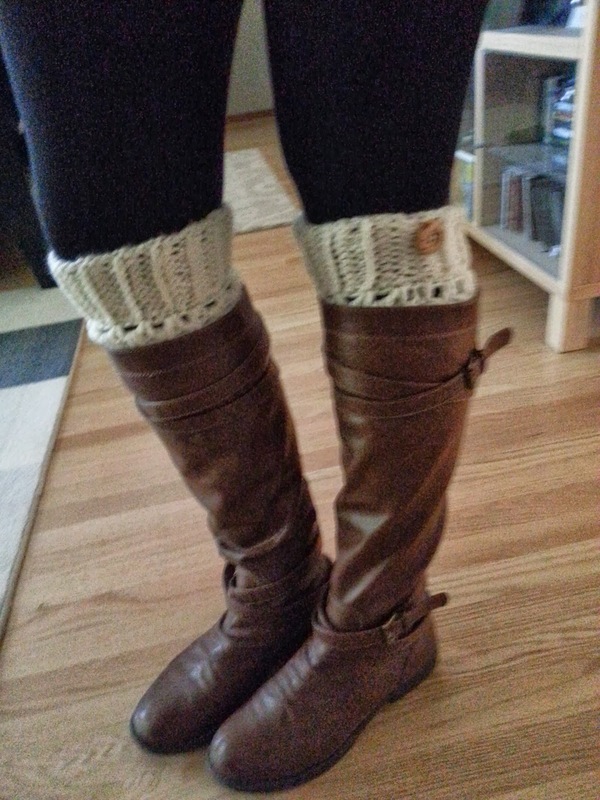 I love your boot cuffs so much! Tried to work on it till late but unsucceed! From row 2 i tried to work on back loops only but it didn't come out like in the picture! Tried to look at green arrow but not sure if it's front or back loops or not both) Could you please tell me what did I do wrong? The green arrow is pointing to the single loop in the front, not the back loop. Thanks so much for your reply! I finished one but it didn't come out well. I used worsted weight yarn and I hook! I didn't know what did I do wrong. I'm very new to crochet need lots of practice. Could you please take a look? Thank you! The top portion of the cuff looks great! The V stitch is where I think you're having a bit of trouble though. 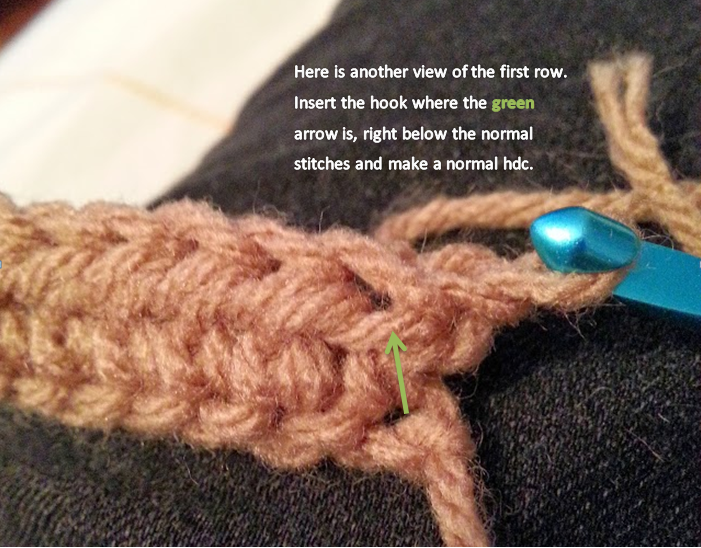 You're making the stitch in the right spot, you just have to make sure that it's a double crochet, chain 1, double crochet in the same spot. That is the V stitch. Hope this helps! Hi Justine! Thanks for the free pattern! I created one cuff so far, but I'm confused about the joining part of the top portion of the cuff. I did 31 rows and only joined row 31 to row 1 by a single sl st at the end of row 31 (at the 10th hdc). Now I have a big opening after I connected the other end of the top (when weaving in ends). Was I supposed to somehow sl st in ever stitch of row 31 to row 1 before turning inside out? Does this all make sense? I've only been crocheting about 2 months so I'm a newbie. Any help would be greatly appreciated! When joining the top portion of the cuff, yes, you sl st in every stitch of the last row and the first row. Hopefully that will eliminate your big opening. 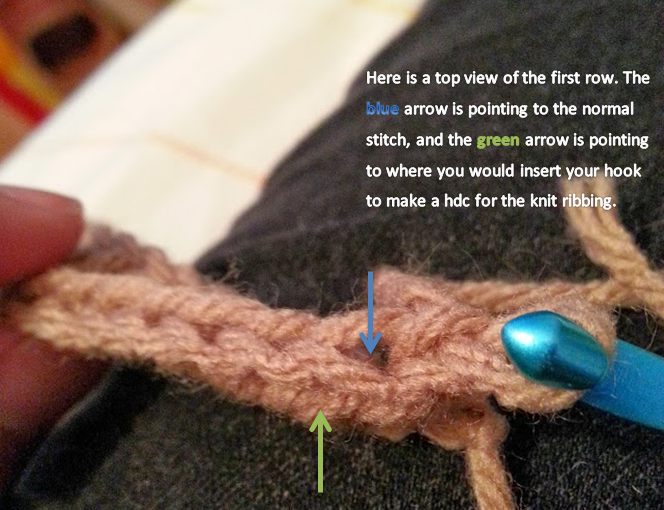 You don't need to connect the other end (it should be all be joined in a complete circle with the slip stitches). Let me know if you need some more help. Happy crocheting! 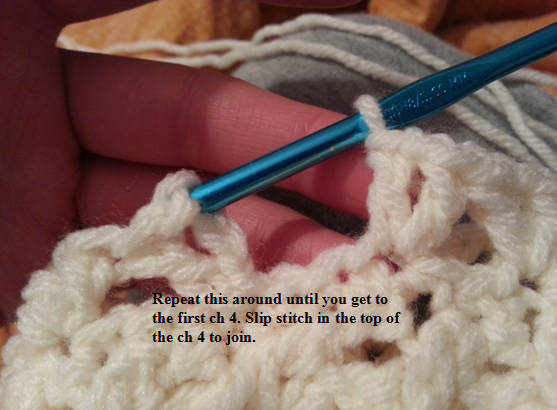 I have followed this pattern exactly only increased the amount of row 2 when making the cuff to 34 and one pair at 36. 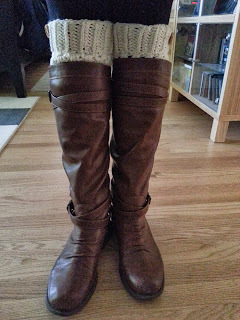 Then I made sure to only do that many single crochet around in round one and my boot cuffs have a tapered look. It is not something that makes them unable to wear just wondered if yours do as well and it just doesn't show? I know though that they are certainly not staying straight if they are supposed to. I would recommend adding a few extra sc in the round before starting the V stitches. That will help make your cuffs look straighter and more even. Hope this helps! I do not understand at all how the top portion works with how it is explained. How is it connected if you're not working in the rounds. The top portion of the cuff is worked in rows, then one end is joined with the other end with 10 slip stitches to make it a rounded cuff. Then, once joined, you work in rounds. Awesome pattern! Thanks a lot! Hello! I just found your boot cuff pattern today on Pinterest and made some adorable boot cuffs! I cant wait to wear them tomorrow on my date with my hubby! Absolutely love these! Im making a few as Christmas gifts for some co-workers. Thanks for the pattern. Hello! Just found your blog and this pattern. I'll be making these for the girls in my sixth grade class...they will love them. Happy Thanksgiving, and thanks for the pattern! I just made a pair of these. I'll have to pick up the buttons to put the finishing touch on them. They are very cute and your pattern was very easy to follow. Thank you for sharing it. I stumbled across your blog with this crochet pattern and I made some for my teenage daughter who just got a new pair of boots. She loves them! 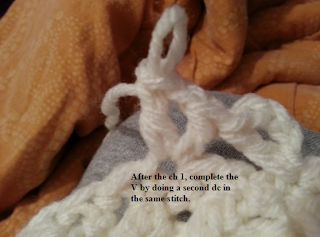 I am a beginner crocheter but I was able to follow your directions without difficulty. Thanks for sharing! I'm so glad you enjoyed the pattern and that your daughter loves the boot cuffs! Have fun crocheting! Thank you so much for sharing this pattern! Hi! I just wanted to let you know that your cute pattern will be featured on this weeks "Sharing Saturdays" over at TheRuralKitchen.com! Cheers! Hi, just stumbled on to your blog, my daughter in university want a few different colours of rhis lovely boot cuffs, so gonna try to make them, but i am just a beginner. I just wanted to know, if maybe you can tell me what kind of wool is this?? Because here in South Africa i dont think we get that specific brand of wool,if maybe you could just tell me if its, 4 ply or double knit or what,if possible please, so that i can get something similar. Thank you!!! I used acrylic 8 ply yarn (DK). Hope this helps, and hope your daughter loves them! I found your pattern on Pinterest and I wanted to thank you for such easy to understand instructions. The pictures were VERY helpful! I'm making these for Christmas gifts and I'm sure they'll be well received. I look forward to trying more of your patterns in future. Thanks again! Hello. I have completed the top part but I have no idea where to put the SC row when starting bottom of cuff? Hi!! My mother is using your pattern (loves it)! She is wondering how much yardage to use for acrylic super bulk 6. Thanks in advance!! very helpful post! amazing boot cuffs and brand new Buy boot cuffs, staylish Baby Clothes. Hello, lovely pattern, but having difficulty. Is the 2nd row, Back Loop Only ? Instead of back loop only, make the hdc in the loop below the stitch you would normally do the hdc in. Please see the pictures for where the stitch should go. 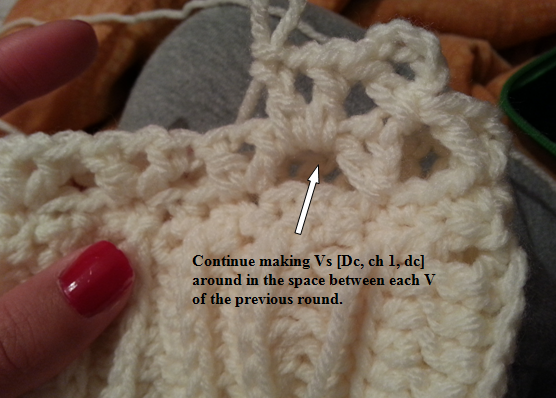 You can still do back loop only if you'd like, however this will not give the knit affect. Hope that helps!